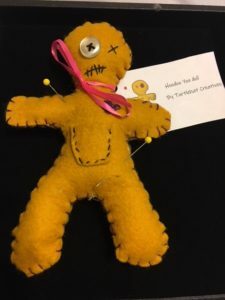 A OOAK Hoodoo You doll from Turtlehat Creatives. He comes with a pocket for a token and some pins. Handmade in a primitive style. He’s ready for the witching hour! Find him at the Etsy store here! No Etsy account? I take paypal direct! Contact me via the form on this site! I can also do custom colors!